Being that this is Christmas, I’m going to share my list of comic book villains that I wish would appear on some of the television series currently airing. Going to start off with The Flash and going to dive in with a somewhat obscure character, Folded Man. 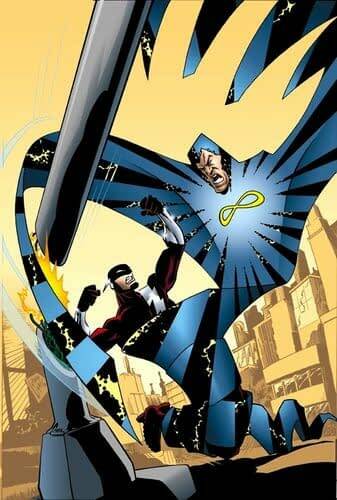 Created by Brian Augustyn, Mark Waid and Paul Pelletier in the pages of Flash vol 2 #153 (1999), the Folded Man is Edwin Gauss, a genius on the level of Mr. Terrific. Gauss was the youngest graduate from MIT and had dedicated himself to finishing Einstein’s Unified Field Theory. Using electronics stolen from Norman Bridges, Gauss built a suit that allowed him to travel between dimensions, into both the 2nd and 4th dimensions. Bridges is hunting down Gauss, claiming the suit as his own since it was made from his technology. In 2D, Folded Man becomes flat, isn’t solid (can’t be hit) and basically invisible if viewed from the side. In 4D he can see everything from all angles and open portals at will, allowing him to attack enemies by surprise. I think what would make him interesting for the series is the visual aspect of the character and how we would make for a really interesting battle for Ralph Dibny, AKA Elongated Man. The series has shown the have the technology to do stretching, so doing a flat person should be easy enough. He’s just a cross between Ralph and Cisco in a way.